In medieval times, the wearing of an agate was said to bring God's favor and make one agreeable and persuasive, giving victory and strength to the wearer and protection from all dangers. 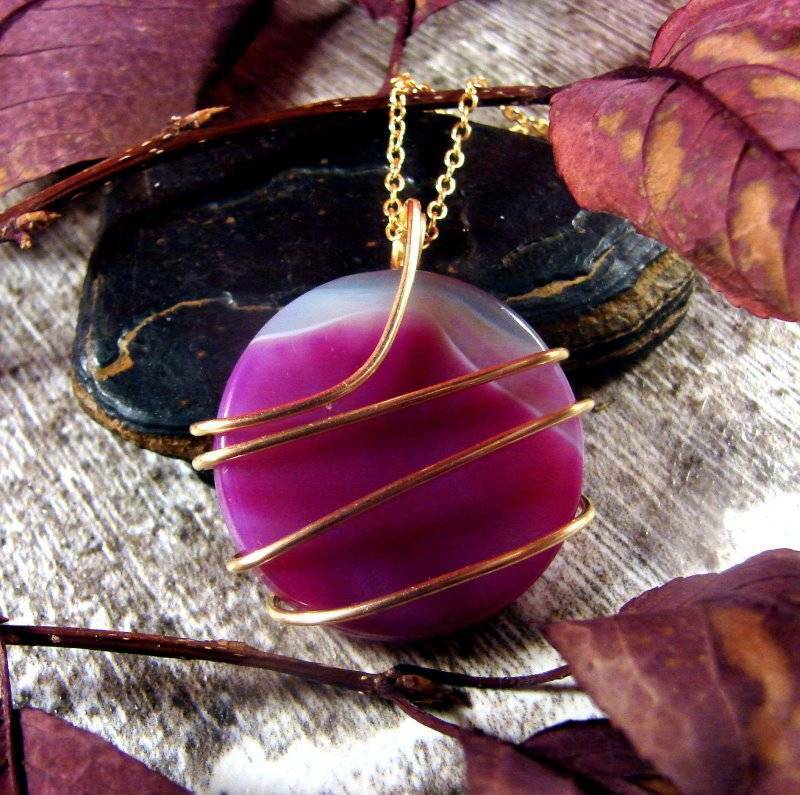 Wearing agate was also thought to give pleasant dreams and cure insomnia. I personally wear agates for strength, and I can feel this extra aid when I'm wearing agate. I consider them important to my vitality and Agate is one of my favorite healing stones. This pendant is approximately 1.7" in length x 1.5" x .6"
Agate is said to enhance one's perceptiveness and to stimulate analytical capacity, and to provide balance between one's physical, emotional, intelectual and spiritual states. Agate is also said to alleviate hostilities and promote goodwill. The word agate is from an old locality on the Achate river in southwestern Sicily. 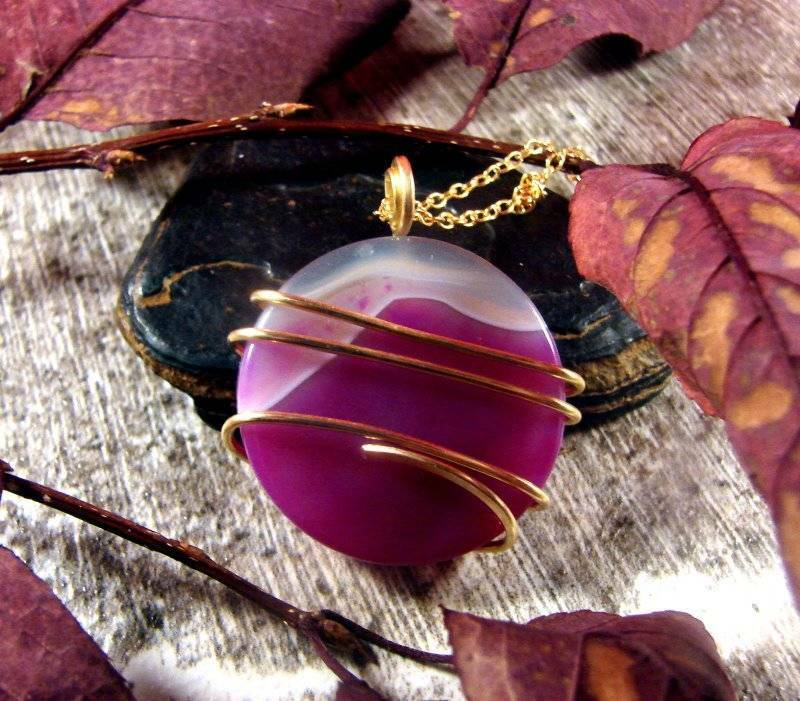 Agates have been used as gemstones for thousands of years. This pendant is hand forged and hand wrapped in Merlin's Gold. Merlin's Gold is Bronze. Bronze has been used throughout the centuries for sculptures lasting centuries and for personal adornment. and is called Gold because of the color and also because of the durability. Merlin's Gold looks virtually identical to 18 Kt Gold. I am an Affiliate of The Association of Melody Crystal Healing Instructors, a Reiki Master, and a Graduate Gemologist through the Gemological Institute of America.